P20078129111	My tent in King's Wood. P20078129114	The memorial commemorating the opening of King's Wood by King Seorge V beside the B1106. Description This walk took me northeastwards to the end of the Icknield Way, and was followed by a long road walk into Thetford. Condition My feet ached considerably after this walk, a sign of the long distances walked over the last two days. Aside from this I had no problems. Weather Today was a dry and warm day, with a mixture of sunshine and clouds overhead. P20078129122	The path across West Calthorpe Heath. P20078129124	The path to the east of West Calthorpe Heath. P20078129126	Pigs at the pig farm. P20078129130	The path leading from the A134 to Euston. P20078129132	Euston village sign. P20078129137	The path heading east from Euston. P20078129149	The path heading north towards Knettishall Heath. P20078129152	Heading north across Knettishall Heath. I woke up several times during the night, but despite this it had not been too bad a place to camp for the night. At a few minutes past three in the morning engine noise woke me, and when I looked out of the tent flap a Land Rover with lights on the top came slowly down the track - I would guess that they had been out lamping. I soon got back to sleep again, and woke up just before six as the birds in the trees overhead started to noisily awaken. The weather had been dry all night and this had allowed me to keep the flap on the flysheet up all night - it had been that warm, and I only got into my sleeping bag after midnight. As I was wild camping it was best not to hang around too long, and after listening to the radio for a short while to help me wake up I started to prepare for the day ahead. My left foot had a blister on a little toe after yesterday's walk, and I burst this and strapped up the other toes with zinc oxide tape before pulling on my socks and getting up. This is easier said than done in my small Jack Wolfskin tent - even with my rucksack left outside - as I did last night - there is not enough room for me to get dressed in it, and I have to shuffle myself half-out of the tent in order to put my shirt and fleece on. The area around the tent was covered in leaves and twigs, and this procedure caused some of this debris to come into the tent with me. It therefore took me longer than I expected to pack up and set off,and as I took the first few steps down the track many of the aches in my feet from yesterday's long slog came back, despite the sandy surface of the track. Fortunately in the first half mile these aches declined, and as I watched the sun rise over the forest to my east my mood lifted and I started to really look forward to the day ahead. The long distance walked yesterday - 25 miles - meant that I would not have so far to walk today, and as it was very early I had all day to do it in. At the point where the forest and track ended at the B1106 road there was a pleasant stone column commemorating the opening of the King's Forest in 1935 - the forest was named to commemorate the Silver Jubilee of King George and Queen Mary that year. The plaque on the column was still readable but I did not stay long, instead heading northwards for a short distance along the B1106. A footpath had been created on the left-hand side of the road and separated from it by a hedge, which made the walk far safer despite the fact that there were few cars about at the early hour on a Sunday morning. The road was soon left behind as a track took me towards Barrow Clump Buildings, where there was a dip in the road filled with water that had to be carefully negotiated. Immediately on the other side of this came a choice as this is the point where the Icknield Way splits. A direct route into Thetford heads off to the left, whilst the proper route heads on eastwards. I had walked the former route before as part of a walk from Bury St Edmunds to Thetford, and so I continued on along the main route. After passing through a narrow strip of trees a track took me southeastwards across fields, passing several large mobile watering systems that seem strangely alien, with arcs of metal stretching between rows of crops, with wheels going between the rows. They must be expensive pieces of kit to make, yet alone to supply with water, and I wondered what crops they were using them on. The next few miles were fairly boring as the track crossed West Calthorpe Heath before skirting the very northern edge of King's Forest for a short distance at Four Corners. The path then followed a track northeastwards for half a kilometre before turning to head eastwards. At this corner was a piggery, and the pigs routinely ran away as I headed past along the track. As the track climbed to cross an old railway bridge to reach New Zealand Cottages the full smell of the pigs started to be blown towards me, and stayed with me for the next mile until the A134 was reached. A short distance down the A134 another track headed of northeastwards for about three miles, and this was a fairly boring but straightforward walk, mainly through areas of trees. At one point there were several large piles of what seemed to be dried pig droppings off to the right, and the smell from these stayed with me for some distance. As the morning was wearing on the temperature continued to increase, and I started to wish that it could have been as cool as it had been when I had first set off. It was not the most pleasant stretch of walking on the Icknield Way, perhaps because of the long length of the trail and the trees on either side obstructing any views, and it was therefore a relief when the A1088 was reached at Euston. The road here was surprisingly busy for the time of day, and after crossing the Black Bourn river on a bridge I reached a bench by the entrance to Euston Hall. This was where I had planned to have my first break for the day, and the moment I sat down with my rucksack on Sencan phone up. As we chatted I struggled to take my rucksack off, and once I had managed this we continued to chat for ten minutes as the traffic roared past on the road. Despite the traffic it was not a bad place to stop, with a pretty war memorial nearby and some cottages that were pleasant to look at. Eventually I had to set off once again, and reluctantly I shouldered my rucksack once again and headed on along the Way. I was running short of water and I had seen no-one who could have filled up my bottles; I was not keen on randomly knocking on random doors to ask for water, so instead I decided to start rationing my water. From here I had walked the entire route at the end of last year in the opposite direction as part of a circular walk to Thetford, and so I was on ground I knew. For the first time on the trip the route had a diversion from that shown in the guidebook; a couple of hundred yards up the track the path diverted off to the left rather than the right, and instead of following a nice path along a track through trees I was greeted with a road walk of over a mile. The road walk was not too bad and there was little traffic, but the underside of my feet soon started to ache with every impact with the hard surface. It was therefore a relief when after a little over a mile, the path diverted off to head uphill along a track to the southeast. This took me up to a trig pillar near Sparrow Hall, and another fairly boring track took me eastwards to reach a road. From this road the path became more interesting for the last mile to the end of the Icknield Way at Knettishall Heath, with heather and trees encroaching on the path on either side gave it a much nicer appeal than the broad tracks of earlier in the day. I soon passed the stone marking the end of the Icknield Way and the start of the Peddar's Way National Trail, and this was very overgrown preventing me from taking any good photos of it. A little further on I chatted to a couple for a few minutes, before reaching the car park that, for me, marks the proper end and start points of the trails. Normally I get a sense of fulfilment from finishing a trail but I did not get this today as I still have thirty miles of the western end of the Icknield Way to do, hopefully sometime in the next few weeks. It had been my intention to stop here for another break, but my water situation persuaded me to move on to somewhere where there might be more likelihood of getting some. This meant joining the Peddar's Way, the National Trail that stretches northwards to the North Norfolk coast, initially passing through a lovely wooded area before reaching a footbridge over the River Little Ouse. The next stretch of path northwards was less interesting, but on the way many people passed me in the opposite direction, making the narrow and slightly overgrown path more into a motorway for walkers than anything else. When the path reached the A1066 road I was faced with a choice; on the circular walk that I had done before I had continued north along the trail to reach a minor road, but that route missed several houses and so I decided to take a different route, initially following the A1066 westwards. This proved to be very busy with traffic, and so as soon as possible I turned off along a track that headed northwards; on the map there was another track joining this one that would take me on into the little village of Brettenham, but large gates and ominous signs blocked that track off. Instead I diverted through the field to the left, bypassing some pleasant-looking buildings that I could see through the hedge to the right, before jumping down to join the road past the gates. A few yards further on a man passed me on a bike with his child in a rear seat, and as he pulled up to a stop at a garden gate a few yards away I asked if he could fill up my water bottle. He kindly agreed, and after some kafuffle in getting the child out of the seat he filled the bottle up for me, meaning that I had one litre of water for the last few miles of the walk. A little further on the road crossed the River Thet on a bridge to reach the very attractive Brettenham Church. Here I stopped, and half of the water soon disappeared, hardly slaking my thirst as it did so. I rapidly regretted not having asked for two bottles to be filled up, and I rested for longer than I intended as I took my boots off to rest and cool down in the shade. I whiled away the time by studying the very attractive church, which looked magnificent when set against the sunny skies from my sitting position. My feet did not have much time to recover and my boots were still warm inside as I set off along the road once more. Almost immediately I reached the road junction near the Manor House, and rejoined the route that I had walked twice before. The road took me westwards, passing the interesting row of stable blocks at Langmere Boxes, and headed on towards Kilverstone Hall. The road was busier than I remembered it to be, but the traffic was not too bad and I soon found myself passing the fascinating war memorial in Kilversone, which looks more like an ornate bus shelter than a memorial. Just down a path to the left is Kilverstone church, and in line with the two previous times that I had walked along the road I did not go to visit it. Soon afterwards the road passed a bustling garden centre and, immediately afterwards, a Tescos store. There is a path that heads down into the centre of Thetford past the superstore and I started along this, but soon diverted off into the store. This was very busy as well, and in the chiller cabinet near the entrance I was annoyed only to find fizzy drinks and no bottles of water, which is what I really needed. I did not want to have to go through the store to find the water, so I settled on a bottle of Lucozade and one of Pepsi Max, purchased them and headed out of the store. The drinks were cooling and slaked my thirst, but after half a bottle of Pepsi Max I started to feel slightly nauseous. I am rarely able to burp, and this means that when I drink fizzy drinks they tend to rest uneasily in my stomach. I walked on, and before I knew it I was at Thetford railway station where I have started or ended walks on numerous occasions. I made my way onto the platform and sat down on the bench near a family, very self-concious of the smell coming from me - a mixture of Vaseline to prevent chaff and unwashed, stale sweat. There was little that I could do about this, but the wait for the train was only a scheduled twenty minutes, although it turned up ten minutes late. It had been a good weekend's walk with a long distance done with a heavy pack, and has set me up well for completing the Icknield Way before moving out of the area. P20078129159	The footbridge over the River Little Ouse. P20078129163	The Peddar's Way heading north to the A1066. P20078129167	Skirting the stables past Brettenham. P20078129169	The River Thet in Brettenham. 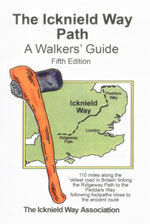 The rest of the walk is from the car park at the end of the Icknield Way. Leave the car park and cross the road and start following the Peddar's Way northwards. It soon reaches a footbridge over the River Little Ouse; cross this and then continue on northwards for a mile on the other side until the A1066 is reached. Here you could continue straight on to a minor road and then turn left, but a slightly shorter route is to turn left and carefully follow the A1066 westwards. A road immediately comes in from the right; ignore this and continue straight on for a couple of hundred yards until another road comes in from the right. Turn right up this road, and follow it as it heads northwards, crossing the River Thet on a bridge and passing Brettenham Church. When the road ends at a T-junction turn left and follow the road westwards for a little under three miles until the A1075 road is reached on the outskirts of Thetford. Turn left and follow this road southwestwards towards the centre of the town. After about a mile a large roundabout with the A1066 is reached, continue straight on here and follow this road as it passes the fire station on the right. Immediately after Croxton Road is reached on the right, turn right up Station Road for a few hundred yards until the railway station is reached, where this walk ends. This makes a total distance of 18.9 miles, with 599 feet of ascent and 680 feet of descent. P20078129171	Brettenham church. P20078129179	Kilverstone war memorial. P20078129188	Detailing on the canopy at Thetford station.